Send a special treat. 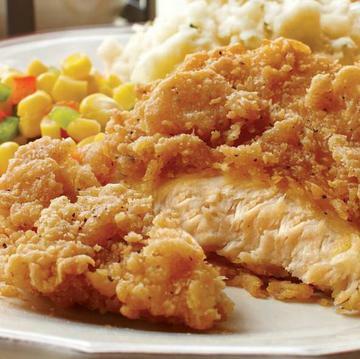 And once you've tried our Chicken Fried Chicken it's going to be your new favorite! Each boneless, skinless chicken breast is hand breaded with onion, garlic and coarse black pepper... for a lot of crunch and a kick of spice. Par-fried for freezer-to-oven convenience, this Southern-style classic is perfect any night of the week. Add our Country-Style White Gravy for even more authentic flavor! We also include scalloped potatoes and green beans. Meals serves 4. Do Not Thaw. Bake: Preheat oven to 400�F. Remove plastic film from tray and place on baking sheet. Place baking sheet on oven center rack; bake for 40 minutes. Remove from oven, let stand 5-10 minutes before serving. Microwave (1100 Watt): Remove plastic film from tray. Place frozen tray in microwave; cook on high for 4 minutes. Remove from microwave, gently stir, return to microwave and cook on high for 2-2 1/2 minutes. Ingredients: Rehydrated Potato Slices (Potato, Water), Water, Cream, Cheddar Cheese (Pasteurized Milk, Cheese Culture, Salt, Enzymes, Annatto [Color]), Parmesan Cheese (Pasteurized Milk, Cheese Cultures, Salt, Enzymes), Contains Less Than 2% Of Natural Flavor, Modified Food Starch, Xanthan Gum, Mono & Diglycerides, Sodium Phosphate, Green Onion, Whey, Granular And Blue Cheese Blend (Pasteurized Milk, Cheese Culture, Salt, Enzymes), Salt, Sunflower Oil, Sea Salt, Dehydrated Vegetables (Garlic, Onion, Red Bell Pepper), Dextrose, Dehydrated Orange Peel, Sugar, Citric Acid, Paprika Extract, Maltodextrin, Spices, Soybean Oil, Sodium Phosphate, Lactic Acid. Contains: Milk, Soy.